Spend any time looking at beer-focused Instagram accounts, and eventually you’ll come across strange glassware; not pint glasses or tulips or glass steins, but vessels that look more like vases or fish bowls. They’re often filled by a so-called “boss pour,” a phenomenon that’s also sometimes called an iceman pour, in which the vessel is full entirely to the brim. It’s a relatively new and—to purists—perplexing development. Even some of the very people behind Instagram accounts with boss pours admit they’re just an aesthetic thing, not to be taken too seriously. But the rising debate over boss or iceman pours has had one silver lining: It’s spurring people to talk about what a beer’s head should look like. And if the goal is to maximize a beer’s aromas and flavors, then a head is crucial to many beer styles. Sorry, iceman. 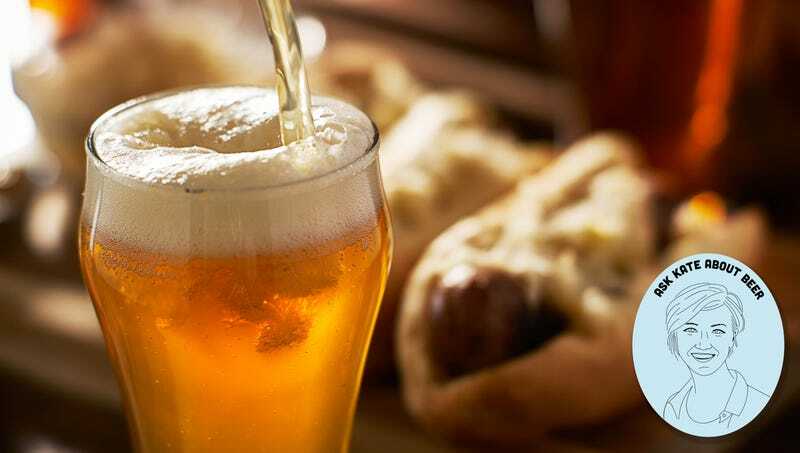 The foam atop a beer head is made up of proteins and sugars in a liquid around a large quantity of gas. Foam is derived from the three major non-water ingredients in beer: malted barley, hops, and yeast. Crucially, trapped within that foam are compounds responsible for beer aroma and, by extension, beer flavor. “As the foam is slightly dissipating, that’s releasing those compounds toward your nose and allowing you to get a good read on those aromatic compounds,” says Brett Bauer, lead brewer at Idle Hands Craft Ales in Malden, Massachusetts. Beer judges know that a beer’s aroma can be quick to fade, as those volatile compounds come out of suspension in liquid. Foam or head helps contain some of those compounds, keeping them around longer for your enjoyment. How much of a head to expect on a beer varies based on beer style. A high-ABV barleywine or acidic Belgian gueuze might not have much of a head at all, while a hefeweizen or American pale ale should boast a noticeable, persistent head. Generally, “one inch of foam tends to be the guideline for a perfect pour,” says Jess Baker, editor-in-chief of craftbeer.com, a publication of the Brewers Association trade group. If you’re pouring a beer yourself, you can maximize your chances for getting a proper head by holding the glass at a 45-degree angle and pouring the beer down the side of the glass until it’s about halfway full, then turning the glass straight up and down and pouring straight into its center. A proper, mousse-like head atop a beer is considered an important mark of quality if you want to fully appreciate what’s in your glass. But some consumers, perhaps with memories of college keggers still in their head, think any beer foam is a bad thing. I’ll drink easy-going backyard beers out of a can or bottle when the situation’s right, but if I’m trying to fully experience a beer’s flavor, I hope it’s properly poured—with a full head—into a clean glass. And not one shaped like a vase, fishbowl, or hummingbird feeder, either.